BrightSparx London are an NICEIC Approved Electrical Contractor in London and accredited Domestic Installer based in Wandsworth. Being associated with NICEIC warrants the confidence and assurance of our clients knowing that their requirements will be undertaken professionally. As expert electrical contractors in London, we also carry work out for the local councils’ Re-Wires. We undertake various electrical services including Electrical Inspection Condition Report’s (EICR), Electrical Rewiring, Cooker Faults, RCD Repairs, Fuse Board Issues, PAT Testing, Outside Lighting, Lamp Replacements and Security Alarms. We are based in Wandsworth, South London and provide electrical services to both commercial and domestic customers in and around London, Hammersmith, Earlsfield, Chelsea, Clapham, Wandsworth and Battersea. Our standards of electrical installations comply with current UK safety legislation, British Standards and relevant codes of practice, BS7671:2008 17th edition (IEE Wiring Regulations) and NICEIC guidelines for good workmanship. Bright Sparx London’s aim is to have a long standing relationship with our customers through quality workmanship and committed staff. We also provide written quotations and reports for personal and insurance purposes. For new installations and larger work we can provide free quotations, and reports for personal or insurance purposes. We have a full Health and Safety Policy, which is available. We also have Employers Liability and Public Liability to 2 million. We adhere to NICEIC and BS Standards for our electricians in Wansdworth. 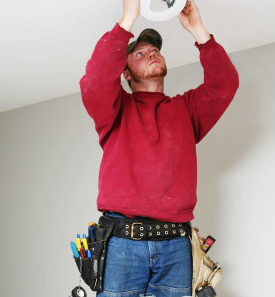 All electrical work under taken by Bright Sparx London is of a professional workmanship.